In lieu of large-scale public housing, school design remains a vital bridge between city, state and federal entities. It is the nexus of the individual and social economy. 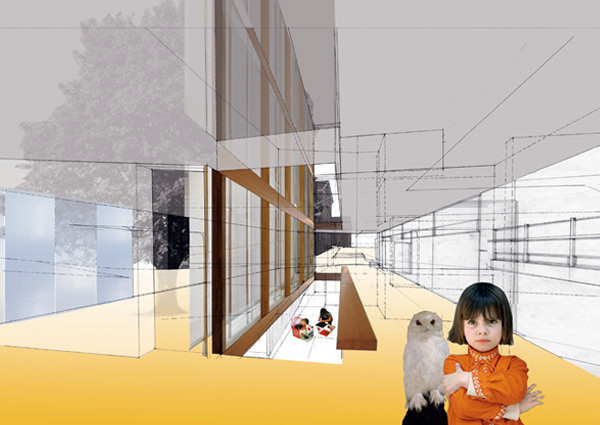 An architecture that seeks to augment educational reform requires an optimistic pragmatism. Our proposal seeks to rethink the Robbins School design and its neighborhood while preserving the strengths and identity of its past. The existing Robbins Elementary School is an early 20th century U-shape school. 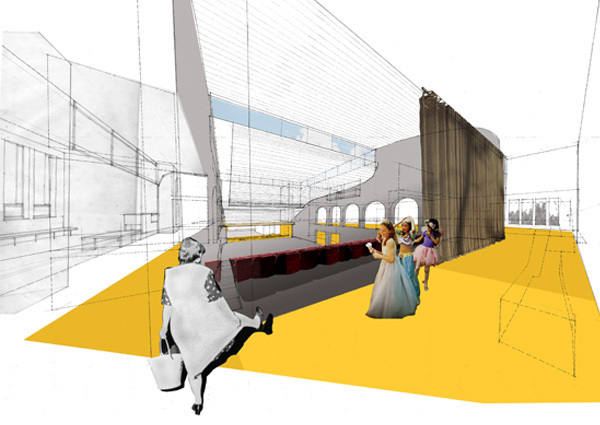 The open connection between the corridors off the classroom wings and the auditorium that they embrace is not, however, archetypical. Observations of the existing school’s daily life reveal that this programmatic overlap entwines, differentiates and anchors daily rituals around the assembly space. This relationship registers as a tripartite vertical shear on the monumental front façade of Robbins. Our approach amplifies the productive ambiguity of these zones. 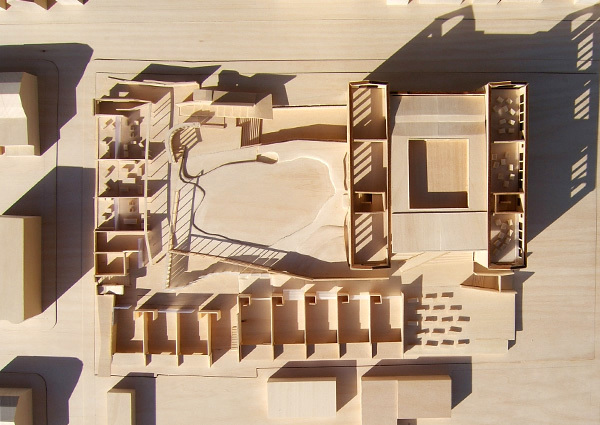 Our proposal reconfigures the U-typology by extending its logic on both an urban and classroom scale. 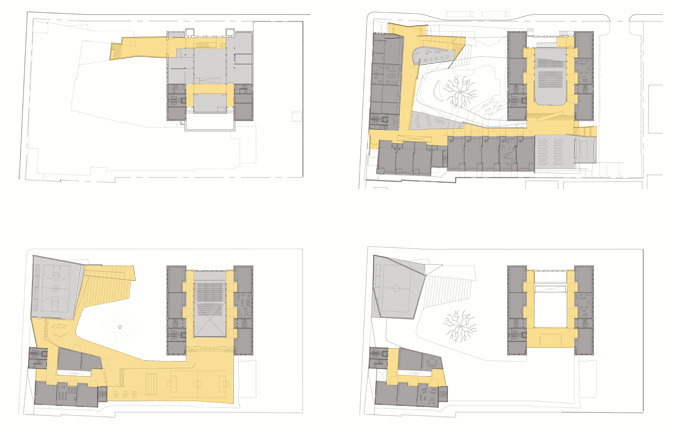 The courtyard developed by the site plan is crucial in thinking "out of the box" at Robbins. It is an urban gesture that is paradoxically welcoming and protective. It creates crisscrossing but clearly controllable paths in, through and around a neighborhood in real need of a safe playground. The prominent placement of the gymnasium elevated on the corner of Benton and Tyler Streets mediates between the existing row houses and the historic school. 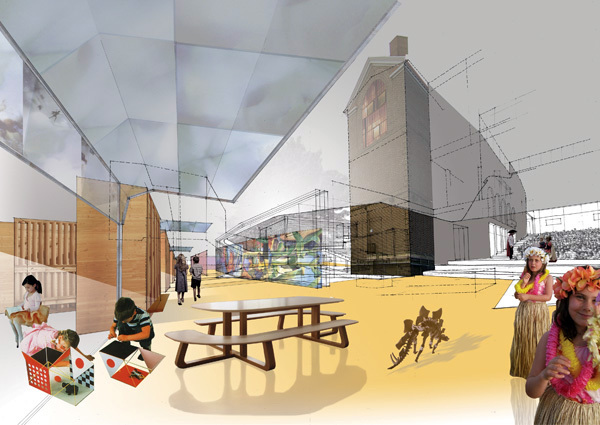 A ceremonial ramp/stair/room forms a filtered gateway via the "parent room" to the courtyard and network of spaces beyond, honoring the daily arrival and departure of the school’s community. The Robbins School employs the Comer educational reform model as a means of heightening teamwork as well as continuity among teachers, administrators, parents and students. Expansion of parental and community presence is the keystone of the Comer model. 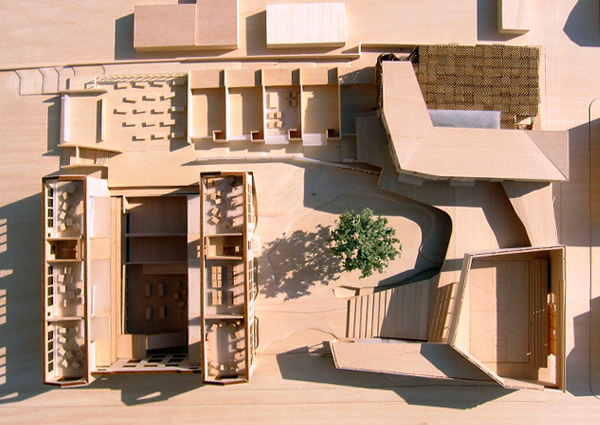 Rather than an architectural translation, this proposal seeks to accommodate spaces for both defined and improvisational activities central to the holistic development of the kids. The programs are zoned to enable after-hours trajectories of use open to the local demographic. Conceived of as a zone of exchange and spatial interlock, the nexus loop is a continuous landscape of smaller learning and activity communities. It is an interface that inscribes and responds to larger programmatic anchors. 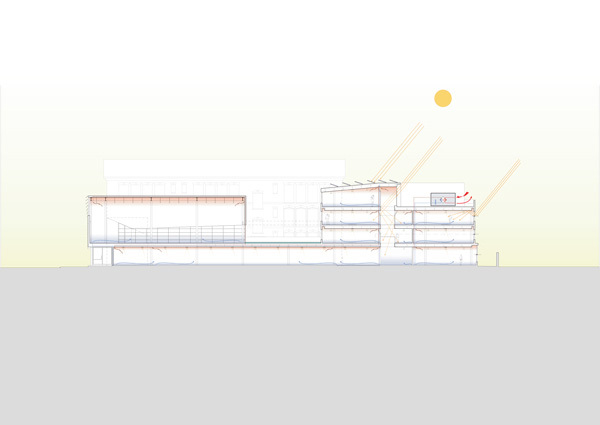 An enlarged auditorium, held as the interior center of the school, slots through the back of the U-plan. It wraps around a courtyard volume bounded by a 4th and 5th grade classroom tower to a munificently scaled ramped entry chamber. 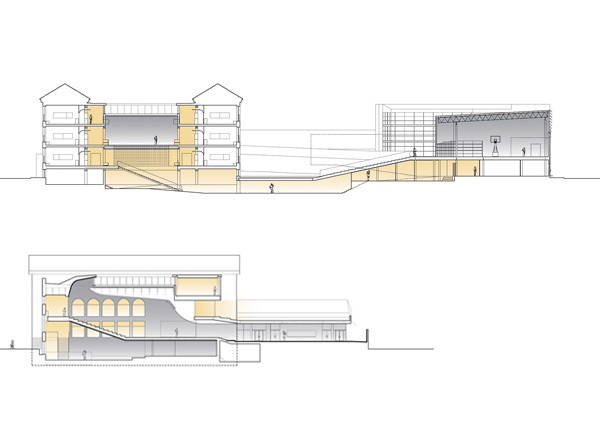 Held by a communal reading room, it simultaneously coils vertically to the gym above and returns under the courtyard to the media space, completing the loop below the sloped floor of the auditorium. 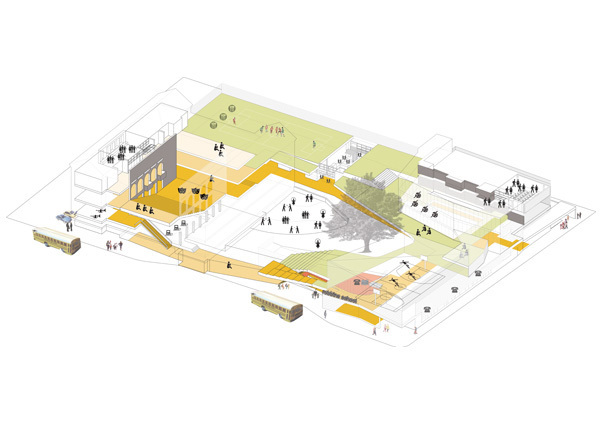 The loop is continuous with the neighborhood ground plane and peels up as a landscape to the gymnasium and playground roof terrace contained by the classroom bar edge. The nexus space is made site-specific by recognizing and defining precise relationships along the loop. The newly formed connection of the lower-level media space to the existing first floor; the mediating presence of areas such as "gross motor skills" and the "parent room" between courtyard and corridor; and the classroom’s various attitudes toward provisional claims on the corridors are different examples of nexus applications. The nexus acts as an armature for particular and less formal points of exchange among the students, school staff, parents and the surrounding community.